Induction is essential to a broad spectrum of our thinking, from categorizing our surroundings to choosing our next action, from artistic creation to scientific discovery. Let’s consider the many faces of induction. This is a loose term that I often use. It means that enough features are the same between the current situation and a remembered situation or known situation that I treat the current situation as if it were the remembered one. Consequences are the same or similar to the same degree that the two situations are. Creation, the “Illumination” stage, is marked by divergent thinking, openness, and excitement. Casual Vocabulary. Inspiration, intuition, imagination, insight, guess, jumping to conclusion, hunch, common sense, superstition, magical thinking, rules of thumb, metaphors, heuristics, sixth sense, second sight. These terms all rely on paying attention to some but not all features of the case at hand. That is, abstraction of detail is a key element, just as it is for induction. Magical Thinking, the attribution of causal relationships between actions and events which seemingly cannot be justified by reason and observation. Magical thinking may lead people to believe that their thoughts by themselves can bring about effects in the world or that thinking something corresponds with doing it. Induction occurs when association, rather than logic, drives a sequence of thoughts. A well-known example is free association. How are associations related to induction, going from the specific to the general, you might ask? Induction requires abstraction and repeated experience that places instances into categories. These categories then become templates for extrapolation from specific to general on each step of the concept elevator. 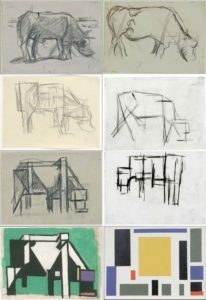 These categories (templates) can be triggered by various initiating instances, which leads them to be equivalent in that sense. Ergo, any instance can be substituted for another in its category, at this abstraction level. That becomes meaningful, because we can perform logic on the instances and their up-or-down abstractions. From them, we can derive different likely results of our potential action choices. Extrapolating from the specific to the general, strips away extra details and formulates its rule across a domain of many instances. Diagram at left highlights that distinct triggering events get placed in shared categories. All elements in a category are eligible to be substituted for any other element in the domain, which then is exchanged with remote areas of the cortex, often with the same initiating impetus which has been categories in that distant area differently. Different consequences, arising from distinctions in ignored details, provide substance for altering the current situation for different results. The 100-Step Rule summarizes observed reaction time and measured neural response times. The rule states that about 100 neural transitions must occur between sensory reception and behavioral reaction. 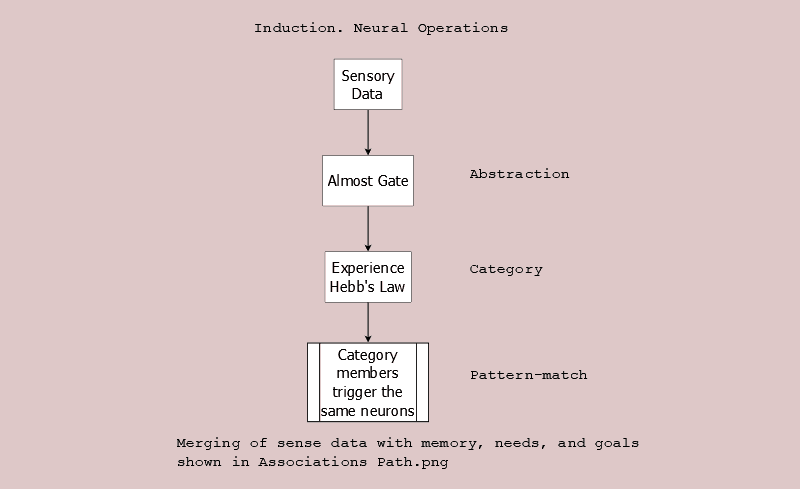 Many neural transitions (passing various Almost Gates) occur in parallel. This parallelism occurs not just across diverse senses, but within senses. The neural visual pathway is not sequential, but parallel. Categorization (identification) of object, movement in the visual field, and location of object proceed along distinct paths prior to the integration we finally perceive. 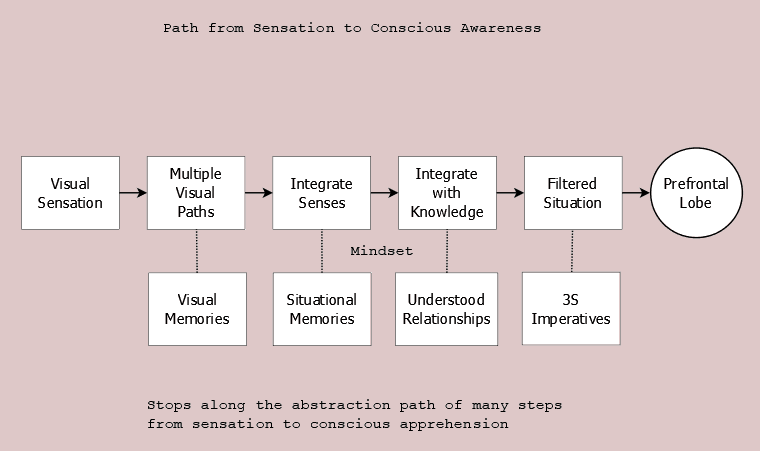 Thus an inciting stimulus may be placed in a common category in one pathway while distinct categories in the other paths. It’s entirely likely thaat similar parallelism with subsequent integration occurs throughout the uniform connectivity that exists in the human cortex. If you feel a threat, immediate action is chosen by straight-line predictions from your mindset. Often forces to strip caveats and exceptions from the relationship you have learned. If you basic needs, goals, and fears are satisfied, you can consider actions in which changes have been made to your working environment. Of course, with the intense interconnections across the corpus callosum, a thought train can switch from association to logic and back in the preparation for our decision-making. Also, induction does not require a conscious decision to use it. It is the natural operation of the brain’s neural construction.